A hero at best can only reflect our cultural values. A hero reflects the way we want to see ourselves. Or how we imagine the best version of ourselves to be. A hero represents our collective dreams and imagination. Heroes are wish fulfillment fantasies while also being ciphers for projecting the best version of ourselves into the future. The hero archetype occurs in diverse cultures around the world. America is home to (and the innovator of) two unique versions of the hero archetype – the silver screen Cowboy and the comic book Superhero. I love Western films and I can’t get enough of Superhero comic books, so let’s talk a little about heroic archetypes, in this case the definitive Cowboy and the Superhero – Superman and John Wayne. A hero can choose their actions and live their values, but can only be truly called a hero by an observer. To call oneself a hero means basically nothing, it is more a label other people apply to the hero. The hero simply is. Modern fictional heroes tend to lean more towards pacifism than historical heroes. But we have no shortage of the soldier/killer hero type of character. Old time Greek heroes from myths and legends thought nothing of killing monsters or their fellow man in the name of their quest, or if the Gods asked them in return for special favors.Modern heroes like Superman resort to violence as a last resort, and try to avoid killing any living thing unless absolutely necessary. To some people this non-violence is the evolution of the hero archetype in alignment with modern human values, to other people not killing a clear and present threat is just naive. There is no right or wrong answer here, merely differences of opinion and cultural values. The shadow side of a hero becomes an imperialist, conqueror or being of power who imposes his (or her) will on another, regardless of circumstance. The hero in shadow becomes a self-righteous person unable to stop being the hero, and who is not really a person concerned with serving the genuine needs of others, but with serving their own needs, and enforcing their will on others as they believe they are morally right to do so. The hero as villain may become a benevolent dictator or world conqueror / self appointed ruler. Superman is the definitive Superhero. He’s a little old fashioned, he sticks up for the little guy and he visits his parents perhaps a little too often. He believes in looking after each other, and he believes in America. He’s the big blue boy scout, the angel on your shoulder that tells you to avoid doing bad deeds, America’s conscience. He’s the guy who blah blah blah blah and he……..ZZZZZZZ….. ……..SORRY! I fell asleep there for a moment. So yeah Superman is a little vanilla, a little boring. At least according to some people. I get it, Superman is not what you would call edgy or cool or extreme like Batman. But frankly I love Superman. I’ve been reading a a fair amount of classic and modern Superman stories lately, and the more I read the more I love the character. While Batman is my favourite literary character, I can’t think of him without thinking of Superman, they are like Spiritual brothers, forever entwined. When I think of these semi-mythic timeless pop-cultural icons I am reminded of classical greek myths and legends. The Avengers are an awesome team, but the JLA are like modern day Gods! I tend to think of Superman like Helios and Apollo, Greek mythic figures associated with the sun. Morrison refers to Superman as the “Sungod from Smallville” – after all, Superman is a living solar battery. The more solar energy he stores, the stronger and healthier he is, and the less solar radiation he has stored the weaker he gets. Take away the yellow sun and Superman’s powers fade away until he becomes basically mortal and human. Superman’s values may be old fashioned but they still have relevance in today’s world. In a healthy creative cycle somebody creates something – let’s say in this case the fictional character Superman. The character becomes popular, and then that popularity declines. Along with the decline in popularity (but not always) comes experimentation, irrelevance, revision, revamp, relaunch, deconstructionism, post modernism, and eventually a return to the original version via Holism. What was old becomes new again, what was no longer in style comes back in style. The classic version of a character re-emerges, now more fully defined, and thoroughly explored after going through the creative literary cycle. From Superman’s humble origins as a champion of the underclasses, the poor, and the disenfranchised to a tool of wartime propaganda and later a corporate icon, to his evolution into a protector of the planet earth from threats both alien and terrestrial, Superman is as Seinfeld calls him “the guy”. Superman is the original, the best, the definition of what a Superhero is, or could hope to be. Despite his metamorphosis from modern day Moses and Samson into a sort of Space Jesus – Superman is still “the guy”. He’s the gold standard all other superheroes are compared to. He is the living inspiration to generations of fictional heroes in the DC Universe, and he’s an inspiration to a few of us here in the real world too. He may be old fashioned like your Grandfather – but he’s also loving, kind, and lives to serve others. One of my all time favourite Superman stories that best represents Superman’s values and what he stands for is the tabloid sized Peace on Earth story by Paul Dini and Alex Ross. Superman: Peace on Earth is a great snap shot of the values that Superman embodies, while also showing the limitations of the Sungod from Smallville. The painted photo-realistic art by Alex Ross in Peace of Earth is based on human models. The base model Ross transforms into a fictional character, with accurate anatomy and lighting that bring his stories to glorious life. Peace on Earth deals with some possible real world ramifications to Superman forcing change on human beings. Despite the realist art style, the book still feels like a mythic tale of a near immortal sun god who walks among us, and painfully realises despite his immense power he has some very human limitations. What Superman comes to realise is that you can help people all you like, but ultimately they have to want to help themselves. People have to want to learn and act on that choice themselves, otherwise your efforts can just make people dependent on your “help”, and will perhaps do nothing to evolve in their own way. This kind of help can even set humanity back by making them dependent on a savior figure, instead of choosing to evolve and think for themselves. Okay we will come back to Superman later, but now let’s talk about John Wayne, the all American cowboy hero. John Wayne was an actor, the most famous screen cowboy that ever was, and in many ways, John Wayne IS America. John Wayne stood for the old guard of America, or more specifically pre-Vietnam and pre-civil rights America where the American dream rapidly became the American nightmare. There were cowboys before John Wayne, but during his reign as a Hollywood leading man, John Wayne became the definitive film cowboy, he defined the cowboy archetype and any cowboys who rode the dusty trails in his wake are forever eclipsed by The Duke. While John Wayne had some controversial, perhaps backwards and conservative views, even his critics admit that he was one hell of a man, who almost never said a bad word (at least publicly) about anyone. Despite his unpopular views during the rapidly changing culture of the post World War II years, and the death of the Western as a film genre in the modern era, John Wayne remains a much loved figure of film culture and Americana. Wayne’s on screen characters were consistently men of good moral character, who stood up to bullies and outlaws. Wayne had a no nonsense way of speaking his mind both on and off the silver screen. John Wayne was a man’s man. He was big, strong, kind and he spoke his mind. One of his most well known movie maxims “A man’s got to do, what a man’s got to do”. Wayne’s on screen persona was one of quiet dignity, strength and good moral character. While off screen he spent most of his time involved in the production of his next project, away from his family, and he never went to war. He was the only person I could think of at the time who could personify great strength and determination without talking much. That sounds easy, perhaps. But it’s not. Either you have it or you don’t. Some of Wayne’s critics felt that John Wayne was a hypocrite for appearing in jingoistic war films, while not going to war himself. At the time, many leading men in Hollywood did go to war. Men such as Jimmy Stewart, Clark Gable and Lee Marvin. Some critics would say there was a disconnect from Wayne’s on screen persona to who he actually was. Despite this seeming hypocrisy, Wayne was still considered a hero by soldiers and civilians alike. With other leading men away during the war, Wayne had very little competition for lead roles. His career had earlier bombed when he first had the opportunity to be a leading man in The Big Trail (1930), only to be sent back to B-Westerns for the better part of a decade. Had John Wayne gone to war, it likely would have been the death of his career, if not his actual death. Wayne would most likely be remembered as just another struggling actor in B Westerns, or more than likely not remembered at all. Wayne forged an enduring partnership and friendship with director John Ford. Ford believed in John Wayne and insisted on casting him in Stagecoach (1939), the film that made John Wayne’s career. Whatever went on off screen, it seemed that John Wayne was fated to become one of America’s most beloved leading men. Personally I feel glad that he never went to war to potentially die a pointless death, as his on screen persona would go on to define the role of the American Cowboy hero for decades. You could say John Wayne had a destiny to be exactly who he intended to be in this life, and nothing in this world was going to change that. While the Cowboy archetype in the negative aspect is one of potential oppression of the Native American people by Colonials, the Cowboy myth in the positive aspect also stands for determination, self-reliance, hard work, honesty and integrity. In short the mythic Cowboy film archetype is also a symbol of the rugged individualism, “can do” attitude and self-determination of America, and is tied to the birth of the American dream. I feel we can all learn a little something from John Wayne, as a on screen example of heroism and determination in the face of adversity, an example of a man of moral character and strong values. Wayne was human of course, and he had his flaws as all of us do. Whether ranch hand, settler, farmer, bounty hunter or sheriff, the Cowboy archetype has many facets and permutations. The Cowboy as sheriff or Lawman becomes the modern day urban cop. Industrious settlers became captains of industry. The farmer Cowboy fulfills the typical american dream of marriage, children, property and prosperity born of hard industrious labor and a “can do” attitude. Modern cowboys still exist in certain parts of America of course, and the general attitude of “Cowboy” is one that America is often labelled with as a whole in a derogatory sense, particularly in reference to America’s never ending invasions and wars in third world countries. The cowboy archetype never truly died and is alive and well in some modern fictional characters such as Pete Perkins (Tommy Lee Jones) in The Three Burials of Melquiades Estrada, Raylan Givens (Timothy Olyphant) in Justified, and Walt Longmire (Robert Taylor) in Longmire. Even John Wayne’s critics had a hard time when they met him in person, finding him an opinionated, strong, likable, intelligent, charismatic and reasonable man. What John Wayne stands for today, is the archetype of the rugged individual, the man’s man. This classical male archetype that has all but disappeared from our cinema screens in recent decades with the rise of the “sensitive” man and the metrosexual dilution of typically old world male values in mainstream cinema culture. From the 1960s-2000 we have seen the death of the manly moral Cowboy hero, and the rise of the anti-hero, the amoral bloodthirsty action hero, and the new age metrosexual hero such as Neo in The Matrix (a thin loner computer nerd who becomes an enlightened Superman figure). We’ve seen our heroes and manly men deconstructed, pulled apart, vilified, called redundant, sexist and old-fashioned. Even James Bond was not immune to the rise of culture clash, and changing gender roles at home and in the workplace. While films like the James Bond series attempted to remain socially relevant by aping changes in cultural values, instead the films merely adopted a horrendously bad politically correct style that left Bond effectively castrated, a shell of his former self. Not until the reinvention of Bond as Daniel Craig in Casino Royale (2006) did Bond get his balls and machismo back. Post year 2000 we have seen the rise of the comic book superhero film, and not so much a return to the old fashioned potentially racist, sexist misogynist Cowboy heroism, as a further evolution and re invigoration of the hero and heroine archetype. Moral heroes likes Captain America and Superman are back on the big screen where they belong, and what was once old is new again. Thankfully a stand alone Wonder Woman film is finally making its way to the big screen, 70+ years overdue, the tireless icon of the super-heroine, the adopted feminist icon and all around amazing Goddess will hopefully get the cinematic treatment she deserves, standing as a rightful equal next to the JLA in “mans’ world”. Old fashioned hero vales may be synonymous with bigotry, but they need not be. We can enjoy heroes without them being sexist killers, racists and colonials. Male heroes can have charisma, charm, balls and machismo, without being cookie sexist stereotypes who put women down. Female heroines can be empowered strong Women in their own right, without just being a reaction to male heroes, or serving as convenient plot devices. The superhero archetype may have been born in a patriarchal world, but there is no reason for superheroes to remain tethered to outdated and irrelevant paradigms. A hero or heroine need not be anything other than what they choose to be. The power of the hero and superhero archetype is not locked into the past, but remains progressive and ever-expanding. A hero need not be implicitly be a killer, enforcer of empire, or the “might makes right” attitude. Many classical and contemporary heroes have been exactly that. But the further evolution of the hero and superhero archetype is not dependent on reinforcing limiting cultural values of the oppression of any individual or group. The hero and heroine archetype does not have to continue to be one of sexism, violence and death, it has far more potential as an archetype of higher values, compassion, co-operation and service to humanity. With popular comic book heroes we get our puritan moral characters such as Superman and Captain America, our dark, cynical and conflicted characters such as Wolverine, Batman and The Punisher, alongside more middle of the road moral characters such as Spider-Man, and monsters such as the half-human/vampire Blade and the genetic atomic monster The Incredible Hulk. The hero-ism and moral values of these characters varies, each can be said to emphasise a different aspect of the human psyche, allowing for playful healthy expression of our higher values and darker desires in safe context. The over dominance of male-centric hero characters and plots reflects an unbalanced patriarchal society while simultaneously showing our fear of embracing the feminine aspects of our psyche, both in men and women. Superhero cinema embraces and draws upon all other genres at its leisure. Action movies, horror, science fiction, drama, fantasy, existentialism, comedy, western. Any and all filmic tropes are up for grabs. The Wild Bunch or The Dirty Dozen can become the Suicide Squad. The Magnificent Seven or Ocean’s 11 can become The Avengers. The further evolution and integration of basic human values in Superhero Cinema is up to the new generation of writers and film makers. Will they continue down the outmoded path of sexist colonial male heroes with women sidelined as femme fatales, kung-fu divas and other ridiculous stereotypes? Or perhaps dare to evolve themselves and their world by writing strong independent female heroines? In my opinion we need more Joss Whedon’s and Angelina Jolie’s in the world. We need to hear the authentic voice of the feminine at all levels of society, particularly in superhero cinema. Getting back to Superman (you didn’t seriously think I was done did you?) – Superman’s story is the ultimate immigrant story. As a character he is timeless and universal. While born on Krypton and adopted by Ma an Pa Kent on Earth, Superman is truly a citizen of the world, an advocate along with Wonder Woman for world peace, and a tireless champion of Justice, Freedom and Truth. The famous phrase “Truth, Justice and the American Way” was not part of the original incarnation of Superman, the “American Way” part was added later during World War Two, most famously it was adopted by the George Reeves Superman TV show, and then became part of Superman lore. Truth and Justice can be said to be ideals that can apply in any nation, but “The American Way” makes Superman into an imperialist, an enforcer of American culture and values. Fans and some writers would argue he has outgrown that status, and has become more like modern world mythology. Superman today then belongs not only to America, but to the world. The character even renounced his US Citizenship in Action Comics #900, however it is unknown whether that story by David S. Goyer was canon, or merely a one off experiment. As a non-American, I agree with the decision of Superman. He is more than an American. He is a symbol of peace, justice and humanity. He is no more the puppet toy of one country. Revisionist and post-modern Superhero stories such as Watchmen, Miracle Man, Dark Knight Returns, Superman: Red Son, The Authority and Irredeemable show the potential negative side of the Superman archetype. These stories show a Superman figure as a potential tool of empire, as an iron fisted tyrant, an otherworldly alien threat (the eternal outsider or “other” who threatens the status quo), and as an mentally ill evil alien God of near limitless power. While these stories are entertaining and brilliant in their own right, their place in the canon of Superhero stories is part of a larger cycle. Creation, Innovation, Experimentation, Deconstructionism, Post-Modernism and eventual metamorphosis back to Holism (the reintegration of the various deconstructed story parts and themes that often resembles the very first version of character) means that even stories not about Superman, ultimately help to define who and what Superman IS, by showing us what he is NOT. In a similar fashion, the Batman “Knightfall” story gave the world a Batman it did not want, and clearly demonstrated that Batman (as an idea) was not broken, and was not in need of fixing. Similarly, Superman is not “broken” or irrelevant. The Man of Steel’s stories are as strong and relevant as the authors ability to write engaging fiction. Superman stories are as emotionally resonant and deeply meaningful as a writer allows them to be. The values Superman stands for are not just old fashioned and irrelevant so much as timeless and subject to innovation that ultimately brings the character full circle back to his earliest incarnation. Superman (and Batman) can withstand endless revisionism and retconning because they are such strong well defined characters to begin with, yet with room to project something of ourselves onto the characters so that we can also relate to them. One writer who has struck a chord with modern fans is Jeph Loeb. Loeb has been a writer for the big and little screens, and comic books for several decades. Jeph Loeb knows characterisation and plot like the back of his hand. More than that, he knows how to reinvent a character for a new audience, or reinterpret a character to bring them back in line with their core values that were present all along. What was old and boring becomes fresh and new again in the hands of a talented writer such as Jeph Loeb. The earliest version of Superman was a man of the people, and for the people. While modern Superman battles crooks, super-criminals and space aliens on a weekly basis, he still rescues cats from trees, saves damsels in distress and helps out the common man and woman however he can. Superman never truly ceased being a man of the people, he just took on more responsibility than anyone could rightly ever ask him to. He transcended and included his earlier stories, he continues to be the champion and inspirational figure he always was and will be, while evolving beyond a simple minded moralistic crusader of Truth, Justice and the American Way. Modern Superman is smart and capable. While the sungod from Smallville walks among us, no less a man than a God, he is still flawed and deeply human. He makes mistakes and questions his actions like any sane person would do. Modern Superman is more complex, more intelligent, stronger and most importantly more human than his earliest incarnation. Superman is in a sense the best of us, or one potential version of what we collectively imagine the best version of ourselves to be. He is a man from Smallville, a farmer, a keen eyed reporter, and a living deity of near limitless power. To some he is Hercules and Samson, to others he is baby Moses floating down the Nile river, to others he is a messianic Christ like figure who suffers for our ill-informed choices, and never complains as all he has for us is Love, tolerance and peace – no matter how badly we treat him. Superman can take it, because now and forever, he is “the guy”. The cloth, the mold from which all Superheroes are cut and defined. The all American square jaw, the courage of his convictions, his kindness and generosity, his tireless service to his fellow man and calm demeanor are what define Superman and make him the person we aspire to be. His humble upbringing on a farm in Smallville and very down to earth old fashioned parents inform who Superman is. Superman is basically the most moral character ever created in Superhero fiction. 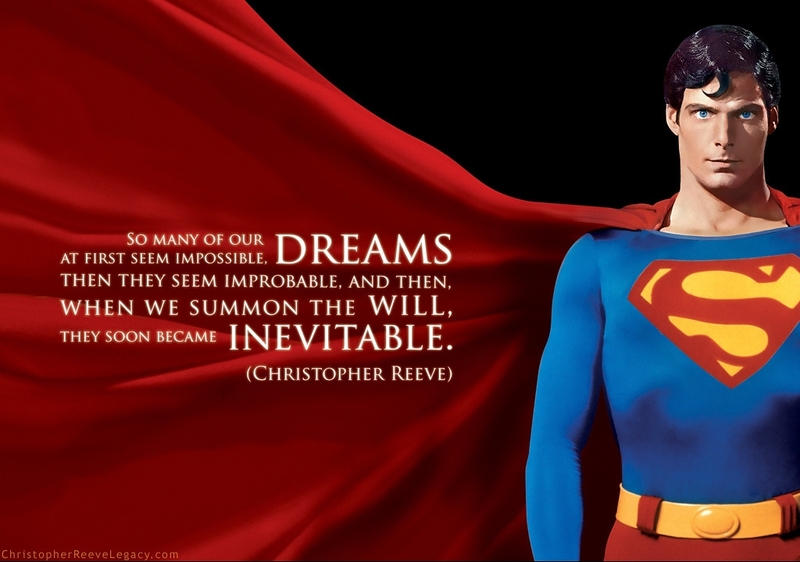 Superman sets the bar of human values and achievement high. While we may never reach the same heights as the Sungod from Smallville who can lift mountains and see microscopic bacteria and macroscopic worlds and galaxies in outer space beyond our limited vision, he knows that we will try to do our best and he will be there to catch us when we fall. Faster than a speeding bullet! More powerful than a locomotive! Able to leap tall buildings in a single bound! (“Look! Up in the sky!” “It’s a bird!” “It’s a plane!” “It’s Superman!”)… Yes, it’s Superman … strange visitor from another planet, who came to Earth with powers and abilities far beyond those of mortal men! Superman … who can change the course of mighty rivers, bend steel in his bare hands, and who, disguised as Clark Kent, mild-mannered reporter for a great metropolitan newspaper, fights a never-ending battle for truth, justice, and the American way! And now, another exciting episode, in The Adventures of Superman! John Wayne was more than one of Hollywood’s most famous and most successful actors – he was, and still is, an icon and a symbol of American itself. Wayne projected dignity, integrity, and strength in all his films, even when his characters were flawed. When I think of the best qualities of America, I think of a nation that has embraced immigrants and diversity, a nation of unlimited opportunity, a nation of freedom of expression, a nation free from the tyranny of Kings, Lords and Royal Families who considered themselves divinely appointed rulers and whose rule was absolute and unquestionable. While those are all fine ideals, the dark underbelly of America is corruption at the highest levels eating the heart of America like a flesh eating virus that will eventually kill its host. I am ashamed at the alarmingly high rate of incarcerated African Americans, the relentless irresponsible spending of the War Machine disguised as “Liberty”, and the propaganda that America has enemies it must fight, or foreign nations it must liberate. I am ashamed that the once proud and free America has allowed itself to be taken over by greedy corporations and mega-banks who control much of the country, and have far more power, money and influence than the Government. It is easy to hike up taxes when there is a war on, or some other fear inducing national crisis to be milked for all its worth. America is a strange nation that makes peace by dropping bombs and shooting bullets, but I question whether those actions are in the best interests of the American people. Home of the brave and free, or home of the unintentionally enslaved? I think of archaic horrendous policies like Rendition and turning back the clock on human and civil rights with Guantanomo Bay. Sadly America has made itself a world leader that coerces other countries through trade agreements to “play ball” or else. To see America as all shiny red and blue superheroes, rainbows and lollipops is to live in a dangerously delusional and naive fantasy world. The worlds of American movies and fantasy paint a different story. They tell us the story of how America used to be, or at least how America imagined itself to be at its best and how it wants to be seen on the world stage. But that America does not exist any more, and you have to wonder at this point if it ever did. By contrast seeing America as all cocaine cowboys, mercenaries, and corrupt governments run by shadow corporations is also only a partial truth. The larger almost incomprehensible truth I suspect is somewhere in the middle, and of course I am using extreme examples to make a point. Every country has its best self and its worst self. What I like about American culture is the spirit of independence within the heart of Americans. I love the “can do” attitude and the will to work to better themselves. It pains me to see that spirit being undermined by a country being divided amongst itself, rather than united. The endless “justified” wars and manufactured over inflated crises that keep people too poor and afraid to do anything to help themselves. The rampant pollution and environmental devastation and corruption at every level that keeps people too sick, stuck in survival mode and afraid to really stand up to the corporate overlords as a collective of free thinking individuals. I love the values that Superman and John Wayne represent, and the America that exists in popular fiction. But was that America ever real, did it ever exist, or was it merely an unrealised dream? I have no idea. The unparalleled prosperity America knew in the post World War II era was in part because the factories and exports of competing nations had been bombed to hell. Once they recovered, life was not so sweet and easy for the average Joe and Jane. A cynical view of Supes and the Duke sees them as conservative puppets of the establishment – but the values I identify with these two icons more than any other are those of hard work, self-reliance, self-confidence, courage and kindness. But are those values rewarded in modern America or are people trying to get ahead in a rigged game? Are people really enjoying the fruits of their labor, or are they finding that Government does whatever the hell it wants to do, no matter what opinions and choices the people voice. What happens when you work hard to get ahead, live an honest life but then the Government decides to take your house away anyway in the name of “progress” and urban expansion? What happens when people fight a war of independence, only to succumb to a virtual dictatorship or at best an Oligarchy from a shadow Government that publicly talks about making changes for the better, while privately locking up and torturing anyone they like without trial after publicly calling them a “terrorist” and throwing away the key? Is it because we collectively LET it happen through not standing up to the authorities who are supposed to represent the will of the people? When did the servants become the masters? When did the officials elected to represent the American people decide to kick out the owners of the house, and change from servants into ego-driven dictators? When did the American Dream turn into the American Nightmare? I love what the Heart and Spirit of America stands for, but does that America still exist? Despite all this, I believe that the Heart, Spirit and Soul of the American people is strong, and one day soon, big changes will take place. The dinosaurs who dictate to the people of America are dying a slow, painful and long overdue death. Their life support machines are failing, their life insurance policies will not be cashed, a new energy, a new blood is being born onto the planet who will be the final extinction of the “Greed is Good” mantra that has ruled America in recent decades. Superman and John Wayne are icons and symbols of America itself. In many ways they ARE America. They represent the best and worst of the nation. They represent freedom and independence, but they also represent the might makes right attitude. To be a hero, you gotta make someone else into the villain, and America loves to invent new villains every week so they have someone to fight or liberate. Their is a danger in the hero archetype that those who see themselves as heroes will enforce their will unquestioningly. Hitler believed himself to be a hero for the German people. He’s no hero in my book. If he were alive and I met him today, I’d punch him in the face for sure no matter what the consequences. America loves to see itself as Cowboys and Superheroes on the world stage, but the danger in that view is that somebody has to become the villain, otherwise the hero just does not exist.. Somebody else has to be “wrong” to make America “right”, hence the constant invention of new enemies and perceived threats. However what I love about Superman and John Wayne is that they are both men of character and principle. It’s easy to be soft and lazy, it’s easy to drop out, not care or be cynical. It takes a tough and emotionally strong person to give a damn, to have the courage of their convictions, to not be swayed by the crowd of popular opinion. The true test of ones convictions is when we stick to our principles during the hardest times in our lives. It is easy to have principles and values when there is nothing that challenges those values. The true test of character is when we face struggle and opposition and we just keep on marching forward, enduring the unendurable, being true to our word, our actions flowing from our principles without hesitation or second guessing. The danger here of course is that we may be wrong. Might does not make right in my view. But right or wrong, our actions speak louder than words. There is no greater coward than a person who refuses to engage with the world, or take any kind of action at all. The man (or woman) who acts and is proven wrong still commands greater respect then the man who fails to act at all. Having tried and failed, those who act have the choice to modify their actions, and learn from their mistakes. Those too full of fear, doubt and the mental virus of self-loathing fail to act, and thus fail to learn or to truly live life in all of its complexity. Having never risked anything, never gained, never lost, the person of inaction can be said never to have lived at all. Cowboys and Superheroes are more than anything, men of action. Dynamic figures of bold confidence who command our attention and inspire with their acts of valor, heroism and bravery. More than their physical achievements, they inspire by example, through being living examples of abstract principles, ideas and values. John Wayne is America. Superman is America. We should emulate the archetypal hero’s core values if we want to better ourselves. We can enjoy heroes and heroines as entertainment, but we should not act out the violence of the Hero, Superhero and the Cowboy. Let the fictional characters act out the violence we feel in our hearts so that we need not enact that violence in the real world. To be like our heroes also means acknowledging and finding a healthy outlet for the darker aspects of our own nature, rather than repressing those impulses. America for better or worse is a nation of achievers and people who take action. Despite rampant corruption in business and government at the heart of America is a “CAN DO” attitude. I can’t say the same about the UK, Australia and New Zealand. If you succeed in America or dare to dream, people encourage you. While in countries like my adopted homeland of Australia, people tend to shoot down your dreams and ask you to “be realistic”. Basically code for “Be mediocre like me, go nowhere, do nothing, attempt nothing, be nothing“. I’d like to see more people taking action from their heart of hearts, and not just thinking of short term goals, but what is good for us as individuals and as an intelligent evolving species on this planet. Superman and John Wayne are men of action, men of myth and legend. Men of moral character, men who live their values in every breath and step they take and embody the kind of self-confidence, dignity and pride that can not be faked. And that is what I love about America, those eternal values that will never die in my view, no matter what corruption festers in the background undermining the hearts and souls of the honest hard working American people. There is power in the hero and superhero archetype, but whatever power it holds is only what we give to it, and what we allow to manifest within ourselves as we live our lives, and live our core values. Superman is not just an alien with extraordinary abilities, far above mortal men… he cares for us. He radiates decency and integrity, it’s not just the powers that makes him a great man, it is because he is Clark Kent. He, the All-American country boy from the Heartland. Clark Jerome Kent is too integral to the mythos and grandieur that is Superman. That rocket could have been choosen to have landed anywhere, at any time, even fleshed out for decades. Could it–would it have been the same? Perhaps, but I am thankful such curiosities are left to Elseworlds. The Kent’s wholesome upbringing they raised Kal-El with is what makes Superman a gentle being filled with warmth, kindness, and innocence. An adopted son of man and Earth with honest values and a big heart.